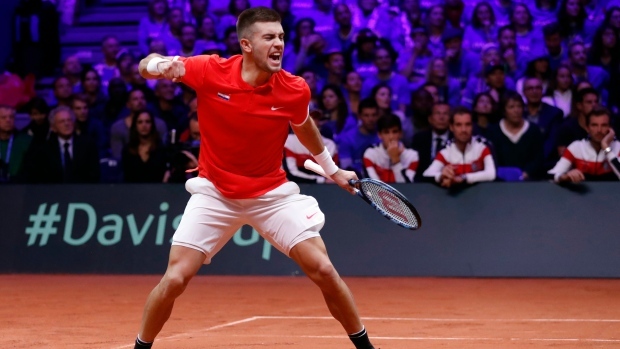 LILLE, France — France captain Yannick Noah's gamble on players and court surface backfired against Croatia in the Davis Cup final on Friday. When asked about his selections, Noah said, "You can try to rewrite history, but it does not work that way." "As long as we are not definitely dead, we always try to hang on to something," said Noah, who guided France to three previous Davis Cup final triumphs, but none from behind. "The court was actually really good, there were not so many bad bounces, it was quite hard, even for indoors," Cilic said. The Frenchman played too short when not hitting too long, and exposed himself to Cilic's ferocious forehand attacks. "The pain was going up and up so I decided to stop and stretch my leg and put some cream on it. It's not a problem, it's just painful," Coric said.